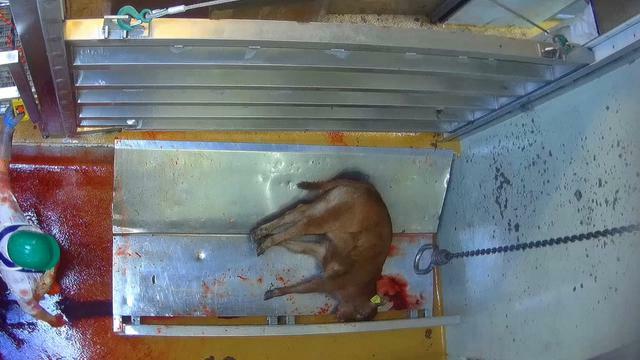 These images, taken in 2018, are from the slaughterhouse of Martigny in the canton of Valais. 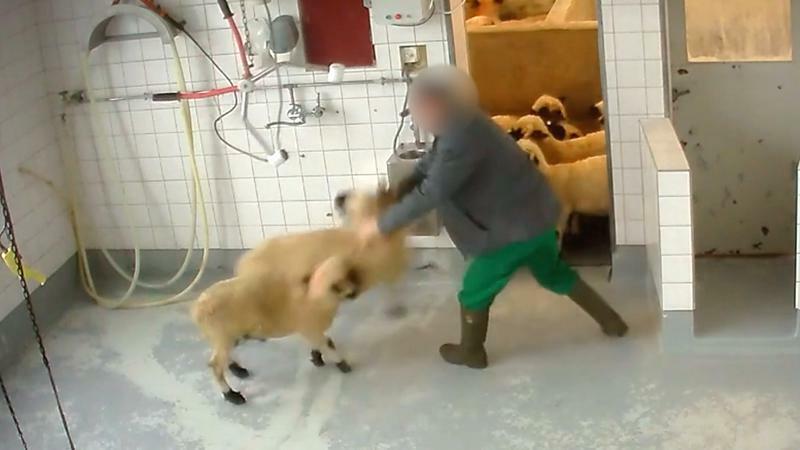 They show that the slaughterhouse does not respect the legislation on animal slaughter: animals are stressed and beaten by farmers and employees, tails are twisted to force the cows forward, stunnings fail with animals’ throats cut whilst still conscious, etc. Moreover, this legalised horror is always present: the animals are terrified, they struggle, resist being killed and finally their throats are cut in front of their companions. There is no such thing as ethical killing for those who do not want to die. However until a fairer world can be created that eliminates this killing, it is essential that veterinary services do their utmost to reduce the suffering of animals in slaughterhouses. 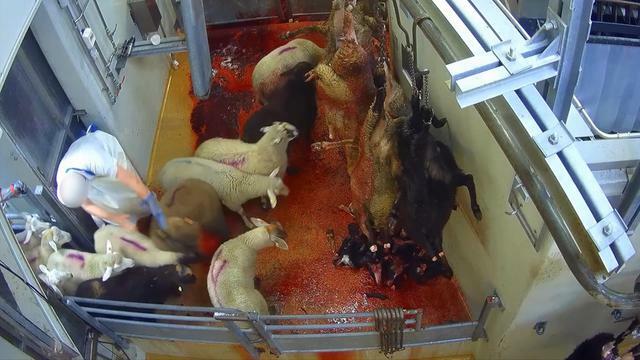 Demand that this slaughterhouse be closed immediately! Farmers and employees hit the animals or twist their tails. The sheep witness the slaughter of their companions. Some cows are not stunned properly. 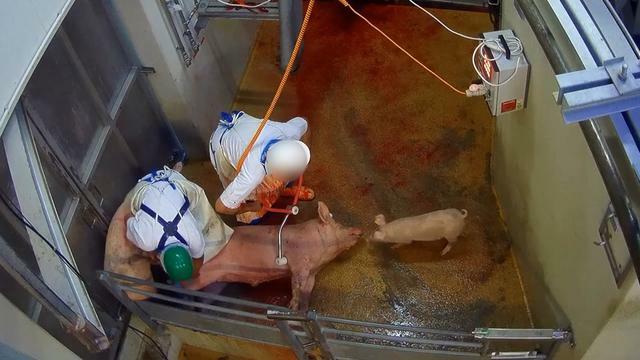 The pigs are crammed together before being electrocuted and having their throats cut. Here, the animals are considered to be only objects that may be discarded. Each of these animals was an individual that wanted to live. Should we really be making a distinction between legal and illegal violence? Hitting an animal is illegal, but killing it is not a problem in the eyes of the law. If it slips on the floor of the abattoir, it is illegal. But if its throat is cut, then legislation does not object. Are not all of these practices shocking? In fact, we kill animals against their will and this can only be done violently after they have attempted various acts of resistance. But when confronted to stunning boxes, cattle prods, electrical tongs, metal bars and captive bolt pistols, how could any animal escape? It is profoundly hypocritical to pretend that there is a "humane way" of killing animals who fight for their lives. Slaughterhouses make up a violent and, by definition, murderous institution. They are the highest expression of the law of the strongest, which our society claims to have overcome. The animals need our help. Let's shut down the slaughterhouses! In modern societies, our relation to animals is based on speciesism. As an analogy with racism and sexism, speciesism is an ideology according to which the life and the interests of animals can be overlooked for the only reason that they belong to a different species. The only explanation for our acceptance of these killings is the fact that we consider animals as disposable objects, with which we can do whatever we please. However, as scientific studies have shown, animals could not be further from objects; they experience complex subjective lives, have preferences, desires, and each has their own personality. Speciesism is indefensible, because human beings are not the only ones capable of emotions. Therefore, we need to respect the lives and interests of the other sentient beings with whom we share this planet. Let's demand that this slaughterhouse be closed! 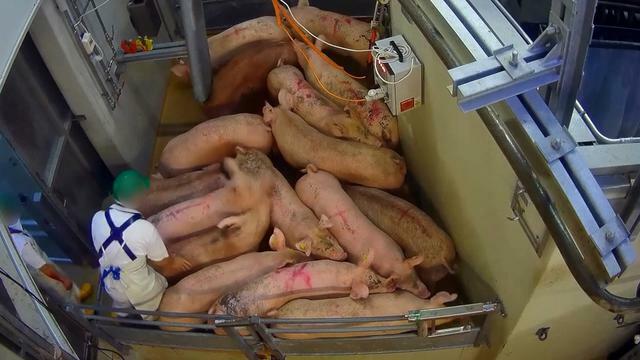 L’association PEA - Pour l’Égalité Animale a publié une vidéo de l’abattoir de Martigny dans laquelle on constate que les animaux sont soumis à des souffrances absolument injustifiables. 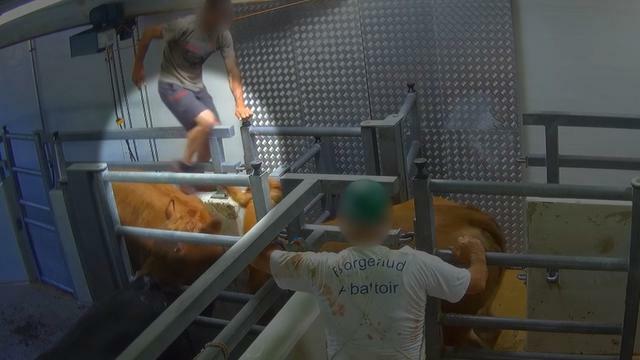 En plus de la violence inhérente à l'abattage, les animaux sont particulièrement malmenés dans cet abattoir. Nombre d'entre eux sont sont mal étourdis et se relèvent parfois après avoir eu le crâne fracassé. Il est même possible que certains soient égorgés encore conscients. D'autres reçoivent des coups de pied de la part d'éleveurs ou d'employés, parfois même sur la tête, ou alors se font tordre douloureusement la queue afin de les faire avancer. Cette dénonciation concerne non seulement les images présentes dans la vidéo publique qui a été publiée mais également de très nombreuses autres illégalités qui n’ont pas pu être intégrée dans cette dernière et dont les vidéos vous ont été fournies. I would like to be informed of the association's activities. The association PEA - Pour l'Égalité Animale (for animal equality) aims to end speciesism and bring about an egalitarian society for all animals. It is urgent to end the unjustifiable exploitation of animals and to start respecting the life of every sentient being, whether they are human or not. Our success depends entirely on the work of volunteers and is only possible thanks to the generosity of our supporters. Support us or militate by our side by becoming a member of the association. The transfer of your details to the payment platform is entirely secure.